George Graham Reviews Punch Brothers' "Antifogmatic"
When is bluegrass not bluegrass? There are few musical genres more defined by their instrumentation than bluegrass. If you have a bunch of people with mandolins, banjos, fiddles, acoustic guitar and acoustic bass, and no drums, you stand a pretty good chance of having a bluegrass band on your hands. True, the 1980s New Acoustic scene provided an interesting stylistic departure, but that was often instrumental music, and elements of bluegrass were there among the jazz influence. This time we have a band with wielding a fiddle, banjo, mandolin, guitar and bass who rather firmly insist that they are not a bluegrass band, and they demonstrate it with a kind of acoustic art rock on their new CD. They are the Punch Brothers, and their new second release as a band is called Antifogmatic. The Punch Brothers are a group of bright young bluegrass and new acoustic virtuosos who have been turning up with their own recordings and in various combinations in recent years. Perhaps best-known is mandolinist Chris Thile, founder of the bluegrass sensation band Nickel Creek. Thile has been recording a series of solo albums since he was in his teens, and in 2006 released an interesting recording called How to Grow a Woman from the Ground, which featured guitarist Chris Eldridge and banjo player Noam Pikelny. Both had come from bluegrass backgrounds -- Eldridge from Tony Rice's band, the Seldom Scene and others, and Pikelny from the bluegrass jam band Leftover Salmon. Thile began performing with the group adding fiddler Gabe Witcher, and then bassist Paul Kowert, and they became the Punch Brothers, turning into a more of a collective band rather than a solo project for Thile. They released their debut CD called Punch which included a four-movement work by Thile. But now they are out with Antifogmatic which is being touted as being a true collective work -- with all the compositions split five ways -- and it's quite a fascinating one. The name, Antifogmatic, they say came from a kind of stiff, usually alcoholic drink from the 19th century, used to brace one for going out in the fog -- literal or otherwise. And they intended their music to have that kind of astringent quality in an acoustic setting. I would describe it as art rock played on the instrumentation of bluegrass, not only like the virtuosic instrumental playing of the art rockers of back in the day, but with quirky, artsy lyrics and song structures that will often execute abrupt shifts. Chris Thile, who does most of the lead vocals, is quoted as saying that the band created a series of characters in their songs who could use an antifogmatic. Most of the songs are about love in one way or another. 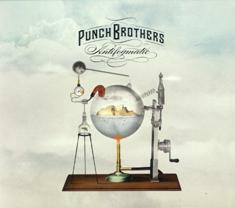 Antifogmatic, the new second release by Punch Brothers is a fascinating recording that uses the instrumentation of bluegrass to create music that is almost entirely different from that style. The band's complex art-rock-like compositions and often-intriguing lyrics combine for music that further expands the boundaries of acoustic music, building on the eclecticism of the New Acoustic scene and going in even further diverse directions. Our grade for sound quality is an unqualified "A." The recording, produced and co-engineered by Jon Brion was done using a minimal setup of vintage microphones. There were virtually no studio effects added, not even reverb. And the recording has a full dynamic range. Almost no detectable volume compression was used, something that is extremely rare these in these days of CD loudness wars. Since his days with Nickel Creek, Chris Thile has been one of the bright lights on what I suppose could be called the post-New Acoustic scene, as have the other members of this group. The music could be a bit esoteric for some, especially those wanting traditional bluegrass, but Antifogmatic is an innovative and artistically deep CD that will reward all the attention you give it.